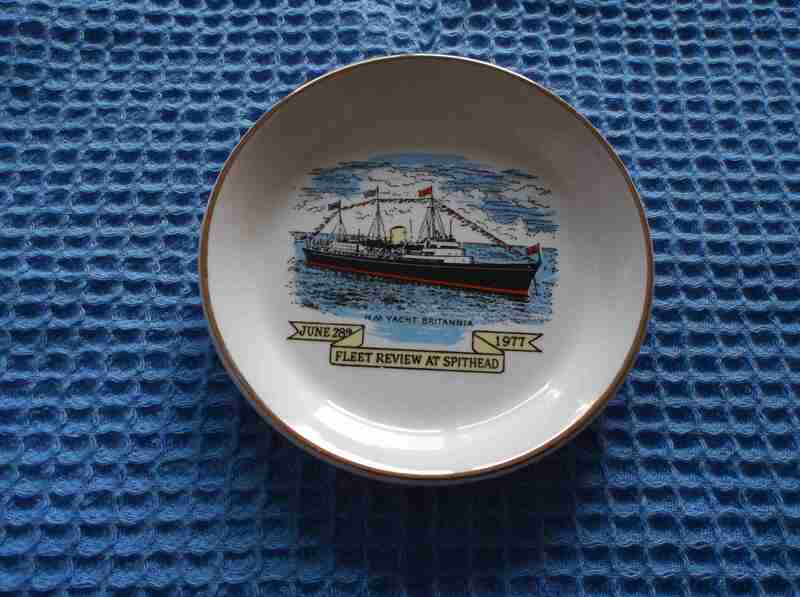 DESCRIPTION -- Dating from 1977 and connected with the Royal Fleet Review on June 20th 1977, this is a round dish souvenir showing in the centre a colour picture of the Royal Yacht Britannia. The dish is 4" (11cm) wide and is in a fantastic as new condition. HISTORY -- Her Majesty's Yacht Britannia is the former royal yacht of the British monarch, Queen Elizabeth II, in service from 1954 to 1997. She was the 83rd such vessel since King Charles II acceded to the throne in 1660, and is the second royal yacht to bear the name, the first being the racing cutter built for the Prince of Wales in 1893. During her 43-year career, the yacht travelled more than a million nautical miles around the globe. Today, she is a museum ship and events venue permanently berthed at Ocean Terminal, Leith, in Edinburgh, Scotland, and is visited by around 300,000 tourists each year. 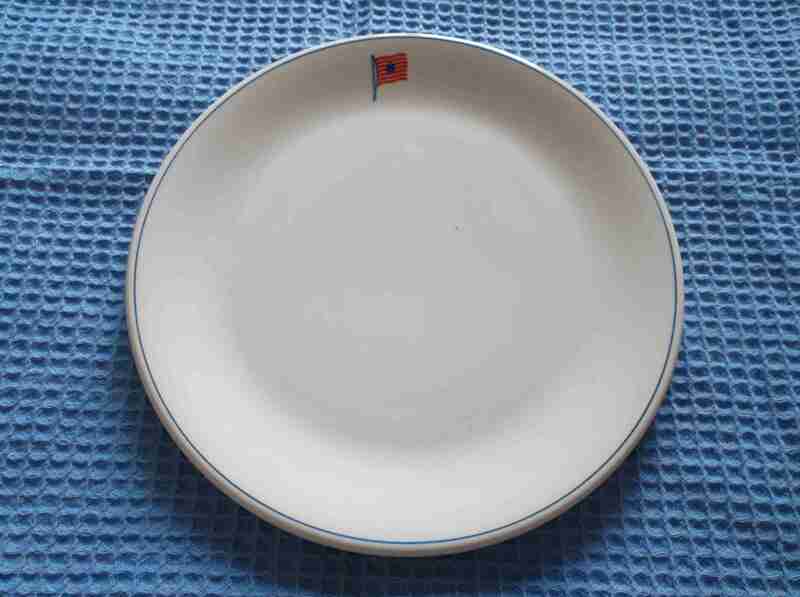 DESCRIPTION -- From the British tanker vessel Thamesfield built in 1959 is a china ship's dining plate. The ship hails from the British tanker company Hunting and Son and is 9" (23cm) wide and the plate shows on it the company houseflag and is in an excellent condition appearing to have little used. HISTORY -- Hunting plc is a British-based supplier to the oil and gas industry. Some 27% of the business is owned by the Hunting family. It is headquartered in London and is a constituent of the FTSE 250 Index. The business was founded by Charles Hunting, a veterinary surgeon, in 1874 as a shipping business. The business, originally known as Hunting & Pattison, was managed by the founder's son, Charles Samuel Hunting, and comprised two sailing ships, the Genii and the Sylvia. In the 1890s the company invested in oil tankers and became a tanker broker. NOTES -- Travellers in Time has now been established over 16 years and has many satisfied customers all over the world. Please email us at sales@travellersintime.net to ask about any items you cannot see listed. DESCRIPTION -- Fantastic as new and excellent condition souvenir spoon from the original Thoresen Ferries Line vessel Viking I. It shows at the top a picture of the ship and the vessel's name. This car ferry company is a world renowned and well known company and the size is 5" (13.5cm) long (click on the picture to see a view of the top of the spoon). HISTORY -- Thoresen Car Ferries began operation in 1964, with routes from Southampton to Cherbourg and Le Havre. The company was set up as the Otto Thoresen Shipping Company by the Norwegian Otto Thoresen, a subsidiary Thoresen Car Ferries Ltd was set up in the United Kingdom to act as its agent. The names of their original vessels Viking I and Viking II, and the subsequent Viking III and Viking IV, reflected the company's Scandinavian origins. DESCRIPTION -- Pair of items from the B.I.S.N.Co. and are two souvenir dishes from the SS Uganda. One shows the vessel at sea and the other shows Ports of Call during a cruise. The size of the dishes is 4" (11cm) wide and they are in a very good condition (click on the picture to see a close up of one of the dishes). HISTORY -- The British India Steam Navigation Company was formed in 1856 as the Calcutta and Burmah Steam Navigation Company. The company had been formed out of Mackinnon, Mackenzie & Co, a trading partnership of the Scots William Mackinnon and Robert Mackenzie, to carry mail between Calcutta and Rangoon. It became British India SN Co in 1862. Under the hand of Lord Inchcape (James Mackay) who had become chairman in 1913, the company became part of the P&O group of companies in 1914 through a complex amalgamation, but continued with its own identity and organisation for another nearly 60 years until 1972, when it was entirely absorbed into P&O. HISTORY -- The Holland America Line is a holiday cruise line based in Seattle. It has been owned by Carnival since 1989. From 1873 to 1989, it was a Dutch shipping line, a passenger line, a cargo line and a cruise line operating primarily between the Netherlands and North America. As part of this rich legacy, it was instrumental in the transport of many hundreds of thousands of immigrants from the Netherlands to North America. DESCRIPTION -- Small round display dish from the German Atlantic Line vessel The Hanseatic and it is in a great condition and the size is 4" (10cm). HISTORY -- SS Shalom was a combined ocean liner/cruise ship built in 1964 by Chantiers de l'Atlantique, St Nazaire, France, for ZIM Lines, Israel, for transatlantic service from Haifa to New York. In 1967, she was sold to the German Atlantic Line, becoming their second SS Hanseatic. Subsequently she served as SS Doric for Home Lines, SS Royal Odyssey for Royal Cruise Line and SS Regent Sun for Regency Cruises. She was laid up in 1995 following the bankruptcy of Regency Cruises. DESCRIPTION -- From the old vessel the SS Ithaca this is an original sailor doll souvenir which is in a good condition and a rare find with the size of item being 9"(23cm). HISTORY -- The SS Ithaca was built in 1956 and went through a few name changes. It is ex. "Zion" of the Zim Israel shipping line. DESCRIPTION -- Souvenir plate from the early tanker vessel company the A/S Schanches Rederi and the size of the plate is 8" (20cm) square. 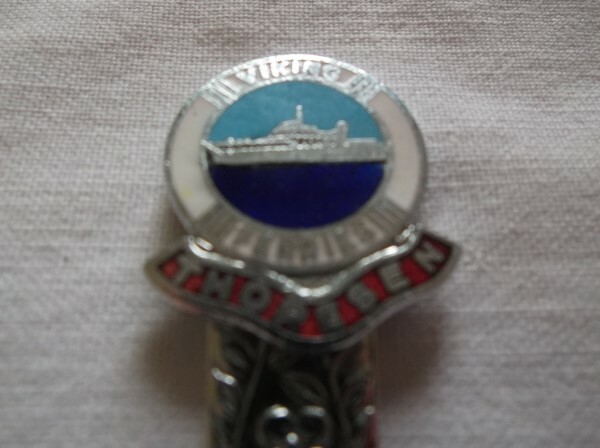 DESCRIPTION -- From the MS Seaward of the Norwegian Cruise Line shipping company a souvenir keyring which is an early item and the size is 3" (8cm) and is in a very good condition. HISTORY -- SuperStar Libra is a cruise ship owned and operated by Star Cruises. She was built in 1988 by Turku New Shipyard in Turku, Finland as Seaward for Norwegian Cruise Line. In 1997 she was renamed Norwegian Sea, remaining in NCL fleet. In 2005 she was transferred to the fleet of Star Cruises.